PLL team members unload supplies and scientific instruments from motorized Mariner One (the red boat) and its motorless companion, Bath Toy. 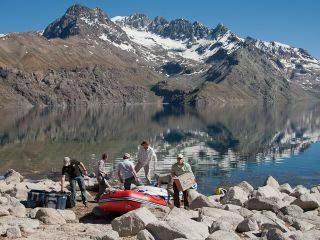 A team of scientists has traveled to remote Laguna Negra in the central Andes of Chile to test technologies that could one day be used to explore the hydrocarbon lakes of Saturn's moon Titan. In addition to preparing us for Titan, the study will also help answer questions about how deglaciation affects lifein glacial lakes. During the 2011 field campaign, Astrobiology Magazine's Expeditions Editor, Henry Bortman, is providing a first-hand account of the team's work through blogs and images. At sunset, the normally gray Meson Alto, the mountain that dominates the view to the east of Laguna Negra, glows with color. After assembling Sunday night at a hotel in Santiago, Chile, the first group of Planetary Lake Landers (PLLers) began their journey to Laguna Negra Monday morning. The most arduous part of the trip was getting out of the hotel parking lot into rush-hour traffic. Because the surrounding land is under Aguas Andinas control, we needed their permission to camp and do research there. At our meeting, we explained the goals of the Planetary Lake Lander project. They shared historical data about the glacier and the lake with us, and we promised to share whatever data we collected with them. Keys in hand to the various locked gates along the gravel road that leads to the lake, we continued on our journey. The plan was to get to the lake and set up camp in one day. But in field research, plans have a way of changing. After a several-hour-long delay in San Gabriel, a small rural Chilean town (fortunately not too small to have both empanadas and beer for sale), we met up with additional members of our team, and began a steep climb up into the Andes. We spent the night at an Aguas Andinas refuge about an hour’s drive from the lake. The next morning, we got our first view of the lake, from a small parking area where the road to Laguna Negra ends. Then began the unpleasant task of carrying camping gear, personal gear, and dozens of hard plastic cases full of scientific equipment down a rocky, winding, quarter-mile dirt path from the parking lot to our campsite. Everything didn’t make it to the campsite that first day — more on that later — but at least we all spent the night in the tents that would be our home for the next three weeks. Quote of the day: "I wish I had a tail." Oliver, one of the arrieros (Chilean cowboys) who helped PLL resolve its transportation problem, leads a mule laden with equipment into PLL Base Camp. Two days after we arrived at Laguna Negra, we were still lugging in equipment. At first, we carried it down the trail from the parking lot to our camp on our backs or in our hands. But there was so much equipment, some of it quite heavy, that it soon became clear we wouldn’t be able to carry everything that way. The solution: mules. And a pair of ferryboats. Mules did much of the heavy lifting. For two days they hauled large, heavy bins and boxes, making several trips a day. In all, more than one and a half tons of equipment and supplies were brought to the encampment, and for two days the place had the feverish feel of a construction site. The work included the construction and equipping of four 20-foot-wide (6-meter) domes covered with white plastic sheeting. Then there was the electrical and communications infrastructure. Nearly 300 feet (91 m) of orange heavy-duty electrical cable had to be wired and strung to bring power from a pair of generators to the four domes and the kitchen. And satellite phones and Internet and Wi-Fi hubs had to be installed and tested, to enable the remote camp to share data internally and communicate with the outside world. The rumored bathroom and solar shower were still nowhere to be seen, but PLL Base Camp finally had progressed to the point to where science — the reason we came here — could begin.